Chairman of Shaanxi Mining workers union – Michael Anagbire said workers of embattled Shaanxi Mining Company in the Talensi District in the Upper East Region are happy with the resumption of work on the Yenyeya and Pubotaba joint concession, after the mine was shut down following the 23rd January accident which claimed 16 lives. The workers in a statement issued after a peaceful demonstration in the district, commended the Ministry of Lands and Natural Resources for a speedy investigation into the accident, saying but for the timely lifting of the ban on Shaanxi some of them would have been faced with severe hardship. They held placards some of which read; “Kwasi Bantama must be arrested”, “Shaanxi must work again” “Concern Citizen Group are Galamseyers, ignore them”. The workers also want the Ministry of Lands and Natural Resources to ensure the implementation of its directive for the closure of all illegal pits in the Gbane mining community. The Shaanxi Mining workers believe that many of the accidents and deaths occur in these poorly created illegal pits, only for some persons to blame Shaanxi. “Even though the resumption of work order has come as a refreshing news to the over 600 workers of the company, we are worried that there aren’t any visible measures on the ground to avert the recurrence of that 23rd January 2019 mishap. … our attention has been drawn to parts of the report of the investigation into the accident which indicate unequivocally that the illegal pits used by the illegal miners to access our underground operations should be sealed before 31st March, 2019. … today is April 3 and yet nothing has been done about those illegal pits,” they said. According to them it is unfortunate that, Shaanxi has always been blamed when accidents occur, while the true culprits most of whom lure inexperienced miners into illegal pits, go about enjoying their money freely. 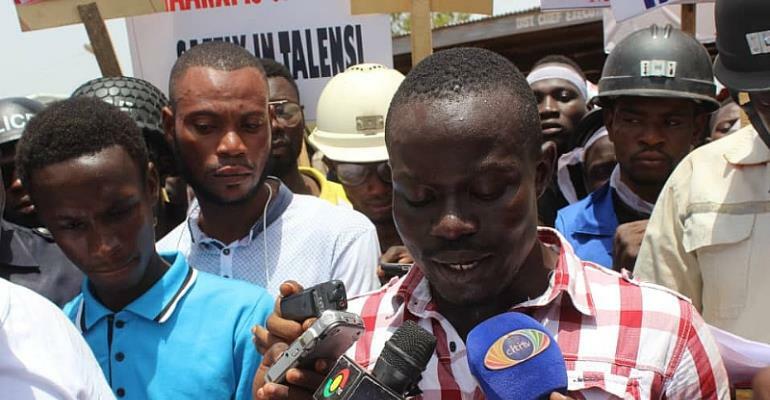 The workers mentioned one Kwesi Appiah alias Kwesi Bantama as one of the persons with an illegal pit in his house and recruits the youth to pass through his pit to steal ore from the Yenyeya and Pubotaba concession . They have advised government not to entertain any form of illegal mining, and ignore the petition of a group calling itself Concern Citizens of Talensi against Shaanxi Mining Company. Their request including a plea to the Attorney General to be proactive in its steps to go to court to set aside an injunction against the sealing of all illegal pits as directed by the Ministry of Lands and Natural Resources. They want Kwesi Bantama to be arrested and prosecuted for the death of the young men in his pit as recommended in the investigation report. The Shaanxi works also want Kwesi Bantama to be instructed to compensate the families of the youth who died on 23 January in Gbane.